The online passive income has become a legitimate way to earn one’s living. If you own a web resource related to WordPress and web design somehow your chances become even bigger. What is the first thing that comes to your mind when you think about promotion, web design niche, and WordPress? It’s affiliate marketing we guess. There are dozens or maybe even hundreds of affiliate programs for WordPress and web design niche you can join. But, which one should you choose? We are going to simplify the task for you. 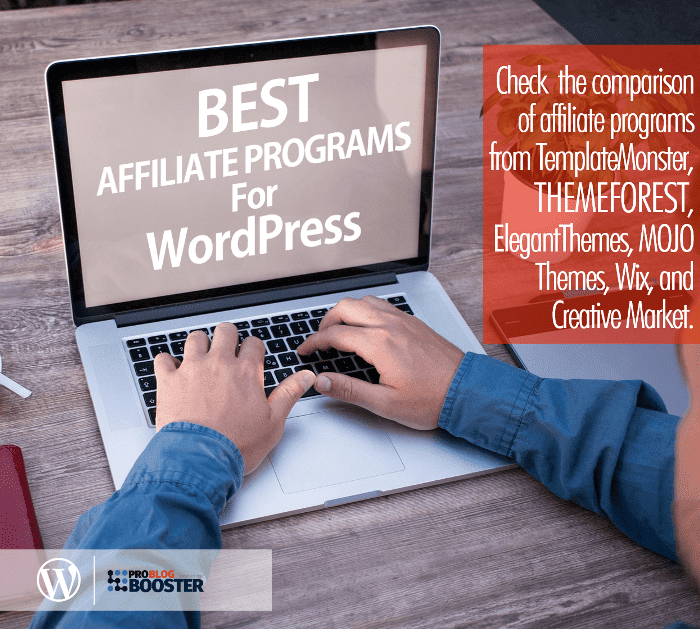 You will see the comparison of affiliate programs from TemplateMonster, ThemeForest, ElegantThemes, MOJO Themes, Wix, and Creative Market. The range of company products. Affiliate tools the company provides. Previously I was talking about; 10 Legal Ways to Make Money & Earn Extra Cash Online Legitimately in 2018 and here in extending to that topic of making money online, I'm going to share few but most trending affiliate programs especially for WordPress related website. MOJO Themes is a marketplace that sells WordPress, Joomla, eCommerce and Tumblr themes. They have about 2,000 items in stock. It’s not complicated to become company affiliate. If you have an account at MOJO Themes, you automatically become their affiliate. Your affiliate ID equals your username. You can use it in the referral links. MOJO Themes tracks everyone who comes via your affiliate link. If a person makes a deposit or a purchase on site, you get 30% commission from their initial payment. If the average price of MOJO templates is $35 you’ll get $10 for each successful referral. Their cookies duration is 30 days. You can enter your account to track your earnings and request the payout at the end of each month. Their payout minimum is $50. MOJO Themes supports only PayPal payment method, so you must have a PayPal account to get paid. MOJO Themes provides you with banners, logos and anniversary banner bundles to enhance your affiliate campaign. 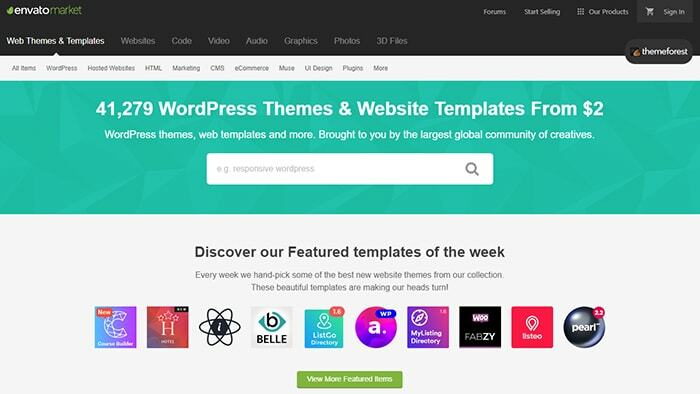 ThemeForest boasts, perhaps, the largest collection of templates on the web. There are more than 31,000+ templates of all types and categories on their website. ThemeForest is a part of Envato Marketplace. It offers you more possibilities to earn because you get your commission when the person you referred buys any product from Envato. What do you need to become an Envato affiliate? You need to create an Envato account and get an approval. As soon as it is done you can generate your referral link and start sending traffic to any Envato page. How much will you earn? You are going to get 30% commission for the first cash deposit or purchase. Some of the eCommerce themes cost $79-$90 on Envato market, however, most of the items cost from $10 to $40. Well, let's assume that the average cost of a template available on ThemeForest is about $30. So, you are going to get around $9 for one sale. The minimum payout on Envato market is $50. You can get your money via PayPal, Moneybookers/Skrill, SWIFT or Payoneer. You can use banners and logos provided by the company or Envato Market API logo if you are skillful enough, of course. 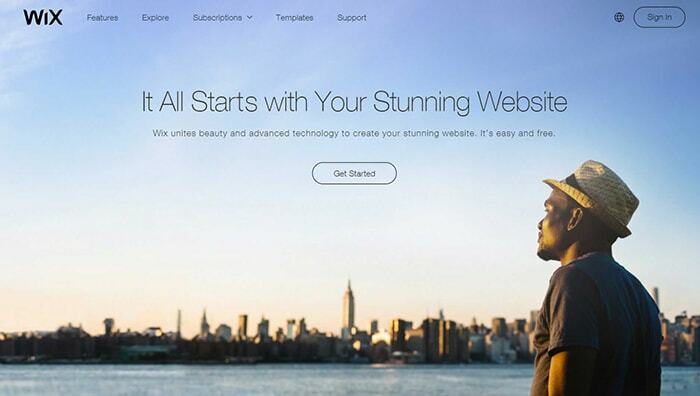 Wix is a cloud-based web development platform. It allows any user to create their own HTML5 website in online mode. This differs it from the rest of the web design affiliate programs. What you should do is drive traffic to Wix, there is no need to promote and sell templates. You earn money when your referral buys Wix Premium Plan. How to become Wix affiliate? Fill in the application form and get approved. Unlike any other affiliate program featured in this blog post, you don't get your commission from the sale. They pay $100 for every premium user you refer. The customer shouldn’t cancel the subscription within 14 days. Seems easy. But let’s face the truth. Free Wix plan is pretty good. It includes everything a person may need to start a website. The conversion might not meet your expectations. You need to refer at least 3 sales per month. Wix cookies expire in 30 days. When can you request your payment? You can claim for payout at the end of each month. They will pay for the sales completed the previous month. Remember that there must be 3 of them as a bare minimum. Wix uses PayPal as the only money withdrawal method, so you need to have a PayPal account. You can use ready-made banners or create something on your own for your affiliate campaign. 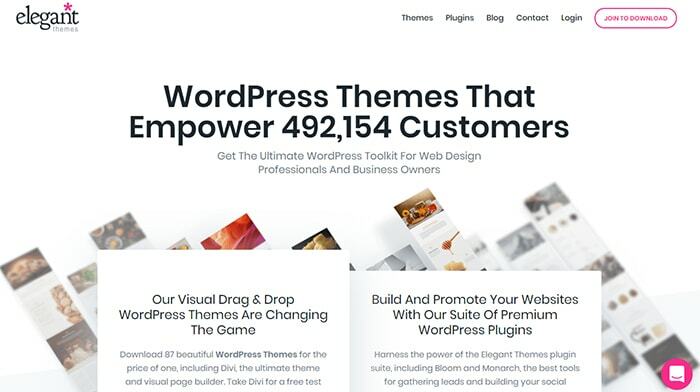 The ElegantThemes collection includes 87 WordPress themes. The company offers an unusual scheme of partnership. You don't buy a particular template of your choice separately, but pay a certain amount and get access to all 87 themes at once. Lifetime Access - $249 once. You will need to create an account at ElegantThemes to become their affiliate. You’ll earn the commission of 50% per sale. The percentage seems to be the highest in the market. Though, you need to remember that choosing one of the pricing plans the person is going to pay once and get all of the available 87 themes. What does it mean for you? This means they won't come back through the same link again for another template. So, you will need to drive good traffic to reach a high conversion rate. Their cookies live for 60 days, which is a good bonus in the form of the renewal commissions. When customers pay their yearly renewal fees you get your commission from that. The company doesn't provide any helpful tools for your marketing campaign so you will have to invent something for product promotion yourself. Creative Market is a well-known marketplace for design. 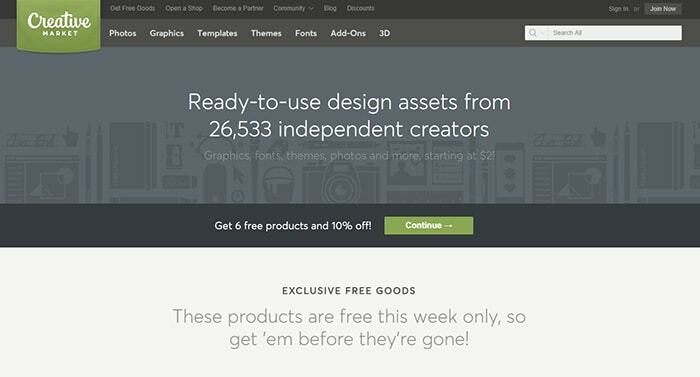 It collects creative ready-to-use design assets from independent creators around the world. As to the themes, they have 7,300 of them (Bootstrap, Drupal, Ghost, HTML/CSS, Joomla, Magento, OpenCart, Tumblr, etc.) in stock at the moment. 3,500 of the templates were developed for WordPress and fit for personal websites, landing pages, and blogs. To become their affiliate you need to apply by means of creating a free account. You are going to earn 10% of every purchase for an entire year from all new customers you refer to Creative Market. Prices for their themes range from $12 to $179. So, the average paycheck is around $25. 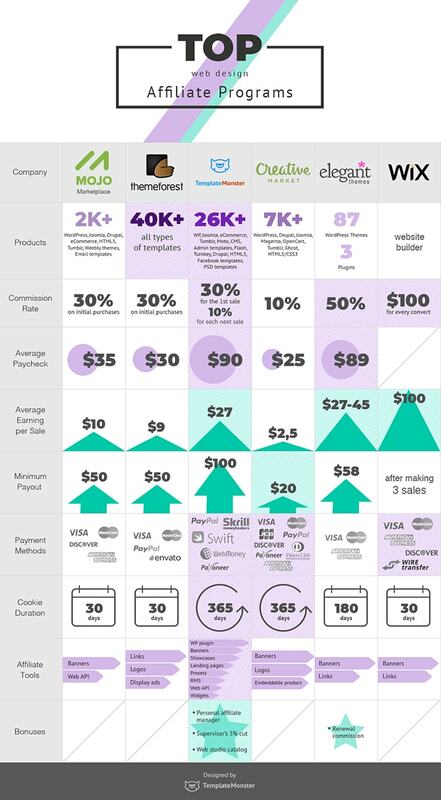 An average earning per sale makes nearly $2,5. The minimum payout is $20. Their cookies live 365 days. The company supports quite a lot of payment methods (VISA, MasterCard, JCB, PayPal, Discover, Payoneer, American Express, etc.). Creative Market provides you with free affiliate marketing tools like banners, logos, and embeddable products to help your business. The TemplateMonster affiliate program by TemplateMonster offers probably one of the most competitive affiliate programs in the WordPress themes in particular and web design in general niche. The company has as many as 26,000+ products of all types and categories in their inventory. Any person can join their affiliate program. The registration process is as simple as entering your email address. You don’t need to go through any approval procedure. TemplateMonster has a clear commission plan. You start with 30% commission and can end up with 50%. Unlike many other affiliate programs, the company pays for each sale. Your commission growth depends on your monthly sales. The more sales you manage to make, the higher commission you are going to get the next month. The average template developed by TemplateMonster costs $90. So, you can get $27-$45 per each sale! The minimum payout is $100, but it’s a piece of cake to earn this sum. The company supports a number of payment methods: PayPal, MoneyBookers (Skrill), Webmoney, Payoneer, SWIFT, ACH. This is rather convenient for the affiliates. TemplateMonster helps its affiliates to reach success. They provide you with all necessary tools. These are banners, showcases, landing pages, WordPress plugins, ready-made shops and many others. There is something for everyone. What’s more, TemplateMonster provides you with your personal affiliate manager, ready to assist you with any issue 24/7. You can call, email or contact them via Skype with any questions. 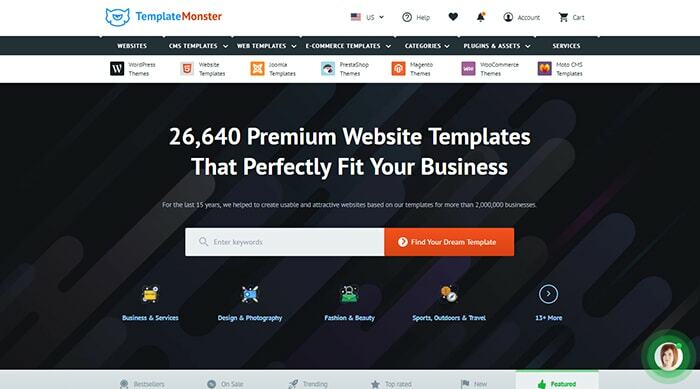 TemplateMonster offers you something you won't find in any other affiliate program. It is the possibility to earn a supervisor's 5% cut. In other words, when you refer other people to the TemplateMonster affiliate program you become their supervisor and get 5% additionally from their earnings. By the way, your possibilities to earn with TemplateMonster are not limited to their affiliate program. If you own a web studio or are an individual web developer, you can be included in the TemplateMonster Web Studio Catalog, which will help you get orders from their clients. You need to pass a Certification Centre course to become a certified company partner. Even if you know nothing about web design, you can still earn exploiting the niche. Participate in the Social Stock project and get benefits from it. Are you overwhelmed with the info? View the infographic below and all major points will become crystal clear for you. The visualized alternative of our blog post has been made in the form of the comparison chart that summarizes everything said above. There are really lots of opportunities for making money from affiliate programs. However, you still need to consider lots of details in order to avoid disappointments. The takeaway is that each web design company strives to show only the pros of their affiliate program. Don't let yourself get into the trap. Study all details, make calculations and conclusions. This is the way to success in web design niche that offers so many lucrative options. Still, have questions about affiliate marketing? Maybe you are eager to share your thoughts or experience? Any feedback from you is welcome, so drop it in the comments.